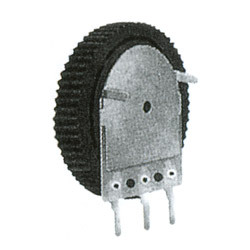 Manufacturer of Rotary Potentiometer, Slider Fader, Encoder, Rotary Switch. 1. 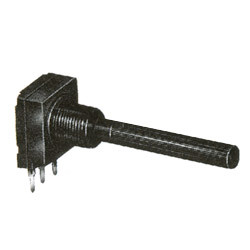 Description: horizontal type with shaft. 2. Applications: suitable for car-audio, TV, VTR, household applicances, measuring equipment and other consumer or industrial products. 1. Vertical type with shaft. 2. Pitch: 5 x 10mm. 3. High quality, best reliability. 5. Dust-proof knob can be attached. 6. Can be cleaning by ultrasonic degreasor with freon or deionized water. 1. Vertical type with cover. 2. Pitch: 5 x 5mm. 1. Vertical type with cover, bule & white color. 1. Vertical type with cover, pitch: 5 x 5mm. 2. High quality, best reliability. 4. Dust-proof knob can be attached. 5. Can be cleaning by ultrasonic degreasor with freon or deionized water. 1. Horizontal type with cover. 2. Pitch: 5 x 2.5mm. 1. Small, dieal for low-profile sets. 2. Audio & video products: such as TV receivers monitors. 2. Audio & video prodcuts: such as TV receivers monitors. 1. 3mm, stand type, single unit, center detent available. 3. Recommended for reflow processing. 4. 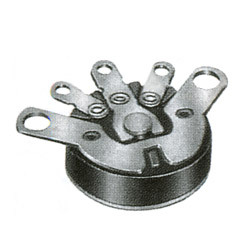 Rotor design compatible with automatic adjustment equipment. 1. 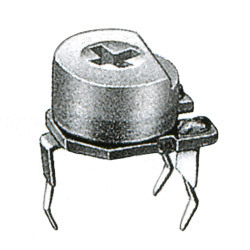 Micro 092 type single-unit. 2. Small, ideal for low-profile sets. 3. 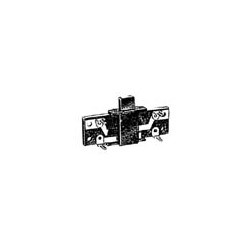 For volume control and ne control in compact AV products such as radio, radio-cassette recorder, micro cassette recorder, compact TV sets and car stereo. 1. 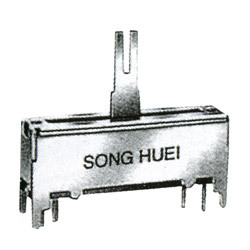 Horizontal type, single unit. 2. Small size, only 9.5mm wide. 3. 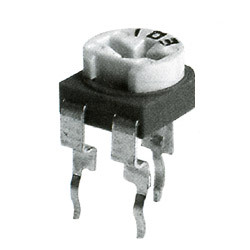 Insert molding with resin around the resistor prevents flex build-up. 1. Small, ideal for low-profile sets. 1. Horizontal type with cover, bule & white color. 1. Horizontal typw with cover. 2. Pitch: 5 x 10 mm. 1. Horizontal type with knob. 1. Vertical type with shsft. 2. Pitch: 7.5 x 15.5mm. 3. Small-size, saving assembly space. 4. 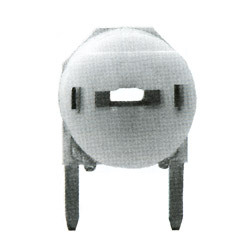 Dust-proof knob or shaft can be attached. 5. The standard stock which can be offered immediately. 1. Pitch: 5 x 2.5mm. 1. 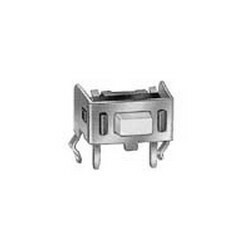 Metal shaft, vertical type, single unit, P.C.B terminals. 2. Rotational life: 10,000 cycles. 3. 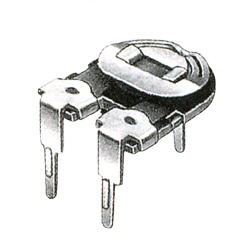 Total resistance tolerance: ±20%(more than 1MΩ± 30%). 1. 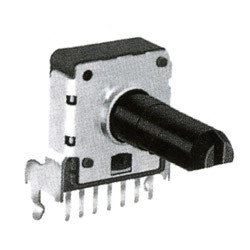 11mm size vertical type encoder with 20 clicks. 2. 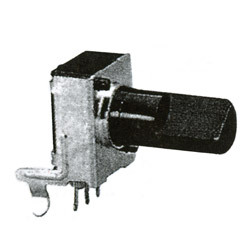 High-precision sliding type encoder. 3. 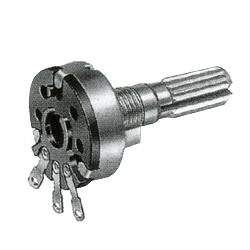 Compact design, long life and high reliability. 4. Low cost as compared with optical type. 5. Available in a wide variety to meet all user needs. 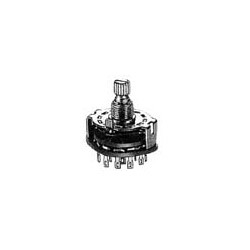 This specification applies to 12mm size low-profile rotary encoder (incremental type) for microscopic current circuits used in electronic equipment. 1. 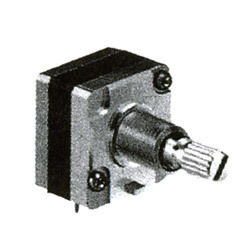 16mm size horizontal type encoder with 24 clicks. 1. 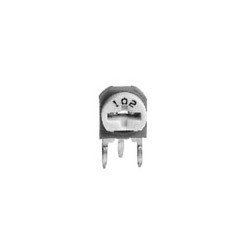 10mm, lie type, single unit. 2. 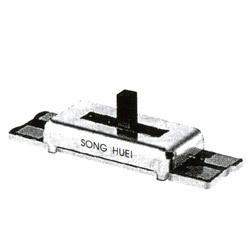 Ideal for volume control, tone control and balance control in radio-cassette recorders. 3. Car audio equipment, headphone audio set etc. 1. Stand type, single unit. 2. Travel: 15mm, 20mm, 30mm. 3. The pot with center tap is not available. 4. Red, orange and green led colors are available. 5. 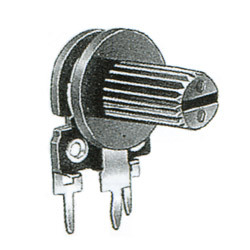 Slim type Illuminated Potentiometers (Non Case With LED). 2. 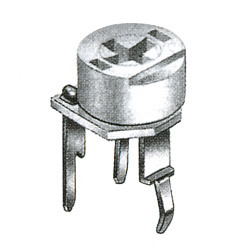 High power but low resistance. 1. 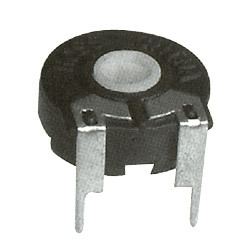 Attenuators wire wound potentiometer. 2. 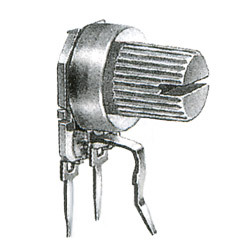 Power rating: 2dB/ 15W, 6dB/10W, 12dB/6W. 3. 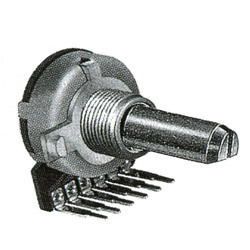 Wire wound potentiometers (L-PAD). 1. 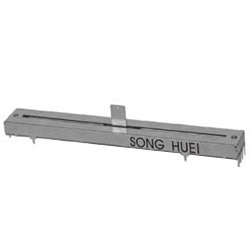 Single unit, horizontal type. 2. 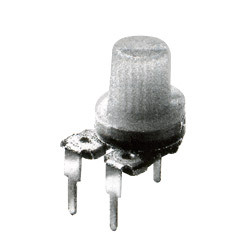 Insert molding with resh around the resistor prevents flux build-up. 3. Available with a wide choice of shafts. 4. 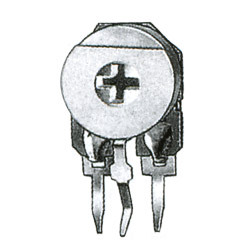 Solderable metal is used in teh snap-in mounting section. 1. Vertical type, single unit P.C.B terminals. 2. 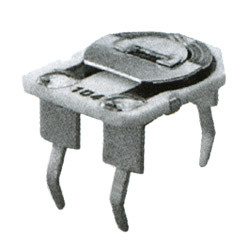 Flux resistance is improved through outsert molding around the resistor. 3. 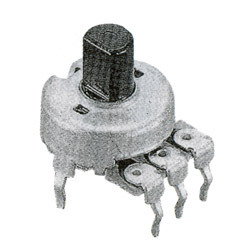 Various potentiometers for such products as radio, radio cassette, TV set, tape recorder and amplifier. 1. 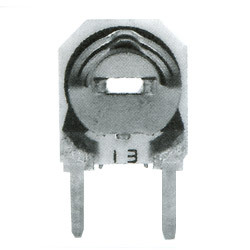 12mm size, single unit. 3. 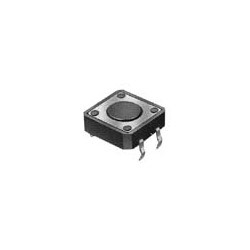 Widely applicable to all types of small electronics appliances. 4. 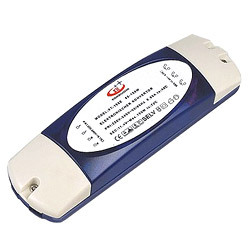 Suitable for mini-radio, radio-cassette recorder and other small electronices appliances. 1. 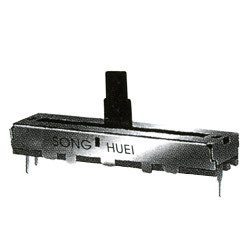 Horizontal type, single unit, solder terminal. 2. Ideal for all types of audio products. 3. Ideal for radio, cassette recorder with radio, amplifier, receiver, etc. 1. Reverse type, dual units, P.C.B terminal. 1. 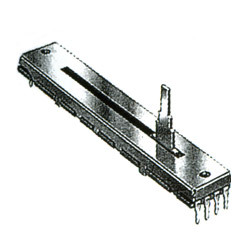 Horizontal type, dual units, P.C.B terminal, with tap. 1. 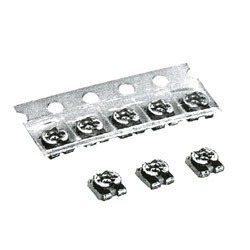 Horizontal type, single unit, P.C.B terminals. 4. 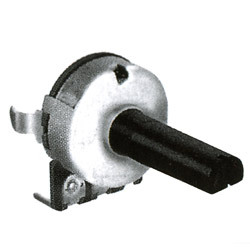 16mm single unit rotary potentiometers (metal and plastic shaft). 1. 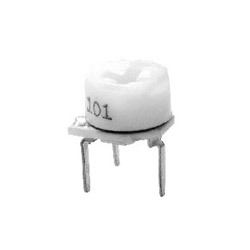 R16KP1 is insulated type. 2. Completey sealed body prevents resin flowing in when soldering. 3. Withstand voltage over 5000V, excellent insulation. 4. 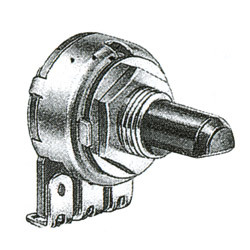 Plastic shaft and bushing prevents causing static. 1. 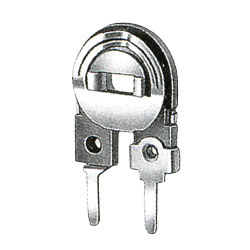 16mm size, single unit. 4. Suitable for mini-radio, radio-cassette recorder and other small electronics appliances. 1. Standard type, single unit. 4. 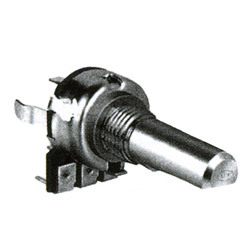 17mm metal shaft rotary potentiometers (with & without switch). 1. 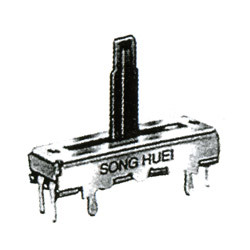 Standard type, single unit solder terminals. 2. 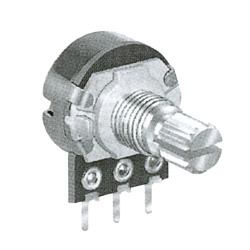 Potentiometers for various audio products can be remote-controlled. 3. Permits motor driving and manual operation. 4. 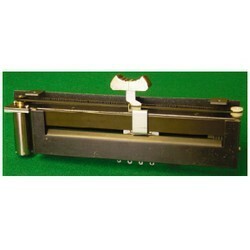 For volume control in amplifiers, CD players, radio-cassettes, VCD, DVD, etc. 1. 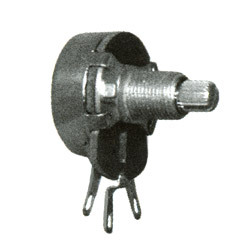 Horizontal type without bushing. 2. 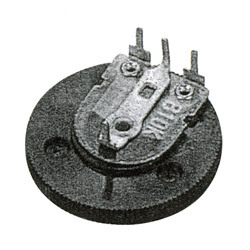 Center click available, single Unit. 3. 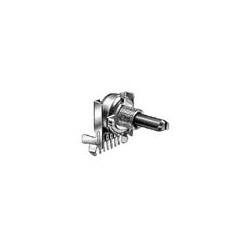 Since a variety of types are available, they can be used for a wide range of products including audio equipment. 1. Single unit with switch. 2. Volume and tone control for amplifier & radio euipments, etc. 3. 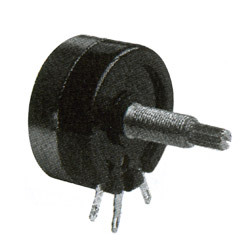 12mm rotary potentiometers (with and without switches). 2. Center click available, dual units. 3. 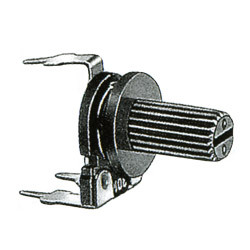 Ideal for volume, ton and balance control of audio equipment. (1) Illustration of solder method. (2) RSL: open type wiring. (3) RBP: PC board type, direction of pins are different from shaft. (1) Signal selection of audios. 1. 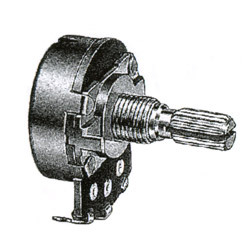 Quad units, single shaft. 4. Ideal for radio, cassette recorder with radio, amplifier,receiver,etc. 1. 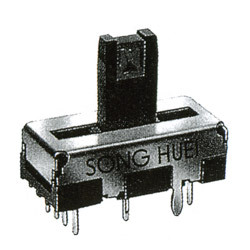 5mm, mini type, dual units for stereo headphone use. 3. Only available plastic shaft. 4. 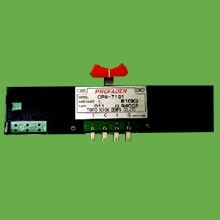 For control of volume, tone and balance in audio equipment, as for grahic equalizers and other various types of equipment. 1. Dual units with LED. 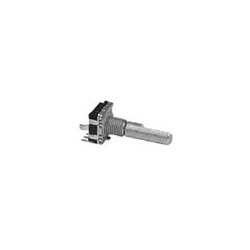 (2) Center detent is available. 1. 15mm, stand type, single unit, center detent available. (3) Customer designs are available. 1. 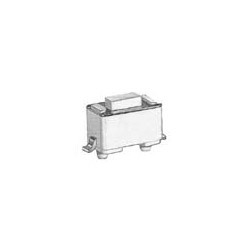 Single unit, P.C.B terminals with switch. 2. 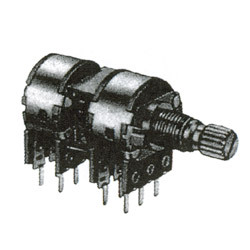 Single unit type with switch. 3. 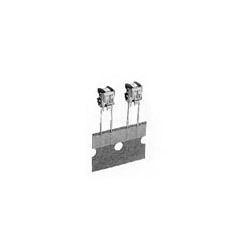 Withstand voltage test: S6KN1- 1 minute at AC 1000V. 4. 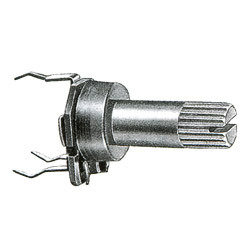 Shaft: insulated shaft & metal shaft available. 5. Volume control, lights control and Speed control. 1. 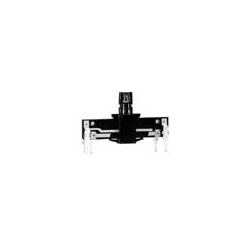 10mm ultra thin micro, single unit. 3. Low cost as compared with optical type. 4. Ideal for volume control and electronic channel selection in pocket-size radio, headphone stereo set, liquid-crystal TV sets, etc. 1. 9mm ultra thin micro, single unit. 1. 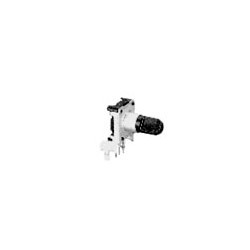 Horizontal type, dual units, P.C.B terminals. 1. 20mm, stand type, single unit, center detent available. 2. Only available plastic shaft. 4. For control fo volume, tone and balance in audo equipment, as for graphic equalizers and other various types of equipment. 2. All in metal type shafts. 4. For control of volume, tone and balance in audio equipment, as for graphic equalizers and other various types of equipment. 1. 45mm, stand type, dual units. 2. Resistance taper: linear (B) and log (A)curve. 3. Total resistance tolerance: 20%. 4. 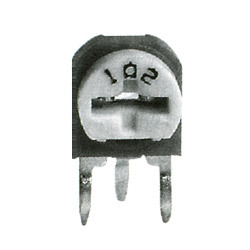 Input impedance: ±20% 10KΩ (standard). 5. Attenuation accuracy: 0~20dB ±3B (for dual units). 1. 45mm, dual units, center click not available. 2. Low-profile design only 8mm high. 3. Minimum lever wobble and easy to operate. 4. The outline sizes are the same between single unit and dual units. 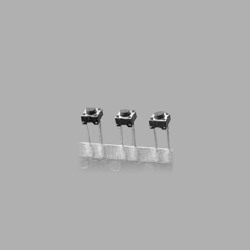 (1) Compact, low-profile surface-mounting type keyboard switches ideal for high-density mounting. 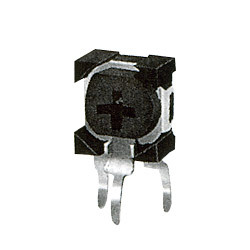 (3) Available with earth terminal for electrostatic discharge. 1. Description: knob(L) available many sizes. 2. Character: permits high-density mounting on P.C. board. (1) Sharp "click" feel with a positive tactile feedback. 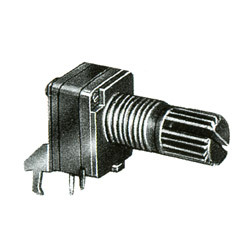 (2) Snap-in type, can be mounted directly on P.C. board. 2. Character： permits high-density mounting on P.C. board. 1. Packing: 1,000pcs per box. 2. Knob(L) available many sizes. 3. 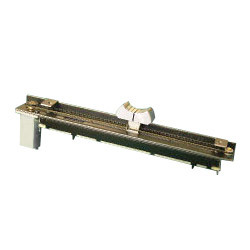 The radial auto inserting machine enables automatic insertion into printed circuit boards. 4. Owing to tactile feedback characteristics, the key touch provides a sharp click feel. 1. 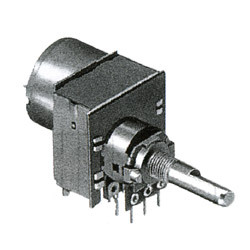 Snap-in insulated shaft rotary potentiometer. 2. Ideal for alltypes of audio products. 3. If you are interested in our products, please do not hesitate to contact us, we will provide you with more information. 1. Resistance taper: linear (B) and log (A)curve. 2. Total resistance tolerance: 20%. 3. 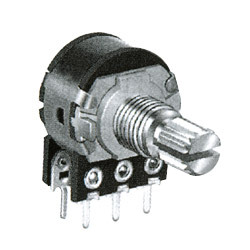 Input impedance : ±20% 10KΩ (standard). 4. Attenuation accuracy: 0~20dB ±3B (for dual units). 2. Short circuit & overload protection. 4. European key components & approvals. 2. 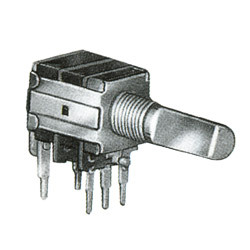 Applications: Operating switches in all types of electronic equipment such as audio apparatus, office equipment, communications apparatus, measuring instruments, TV sets, VCRs, etc.